Our caravan is adjacent to a camping area by some trees. The Park is flat and is at the back of its own private sandy beach with an adventure playground. This location is ideal for a variety of water sports. There is car parking next to the caravan and we consider a car is necessary for this location. The Park has excellent facilities with a Seahorse centre including two indoor heated swimming pools (one includes a flume), bars, restaurant, activity area and gymnasium. There are also outdoor tennis courts, mini golf, and games arcade. There is a launderette, supermarket and off-licence, and a hire shop for bicycles, dinghies and canoes (open from Whitsun to early September), as well as a boat launching service and water sports facilities. The Cornish coast path runs around the outside of the Park, and the Lost Garden of Heligan is a few miles away. There is also, at an extra cost, Pentewan’s Beach Sports Centre provides a wide range of activities including formal tuition for all ages. 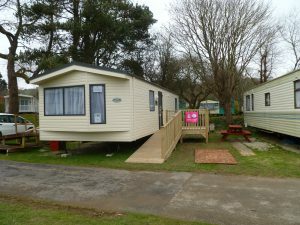 This was a brand new caravan in 2014 and has been specially adapted and is suitable for wheelchair users. 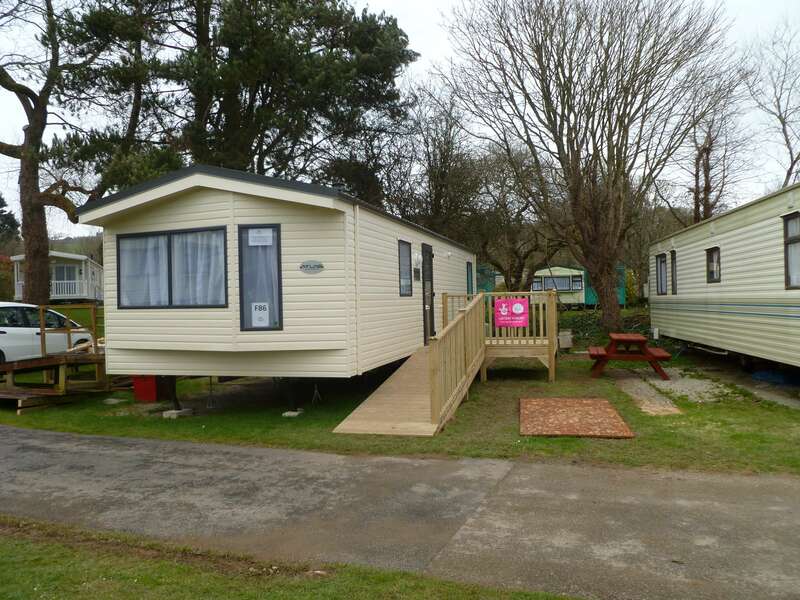 The caravan has two twin bedrooms, one with ceiling pulleys and there is a double pull-out-bed in the lounge area. The bathroom is a wet room. The caravan is double glazed and has central heating throughout. There is also a gas fire in the lounge.